Kawasaki have revealed more images and details about their new direction for supercharged motorcycles with the Spirit Charger and Soul Charger concept images, and their new ‘Balanced Supercharged Engine’, at the Milan show. Kenji Tomida, President of Kawasaki’s Motorcycle and Engineering Company, shared a second concept sketch of their new bike – which has been dubbed the SC-02 Soul Charger, which sits alongside the Concept SC-01, the SC standing for Spirit Charger in this case, that was shown at the Tokyo Show last month. Just like the H2 and H2R launched last year, this new model would be designed in-house using a new superchargered engine, but – suggests Tomida – this time it could be a smaller capacity, rumoured to be around 600cc. Kawasaki say it demostrates the company's ability to make their technology 'scalable' for different applications, and hints at even more variants in the future. 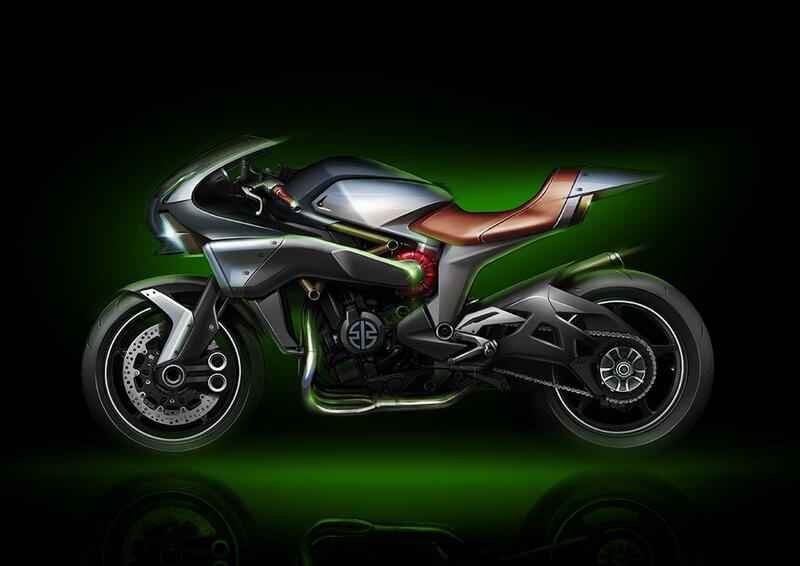 Concept SC-01 was described as “just one of the fascinating directions Kawasaki’s design team are considering for the future of the forced induction motorcycle line. With softer, more luxurious materials chosen over the hard-edged performance-focused approach of the Ninja H2 and Ninja H2R, the flowing lines of Spirit Charger suggest a machine suitable for all-day, long-distance enjoyment and comfort.” Whereas the Soul Charger is clearly a naked streetfigher, or roadster, aimed more at shorter journies. 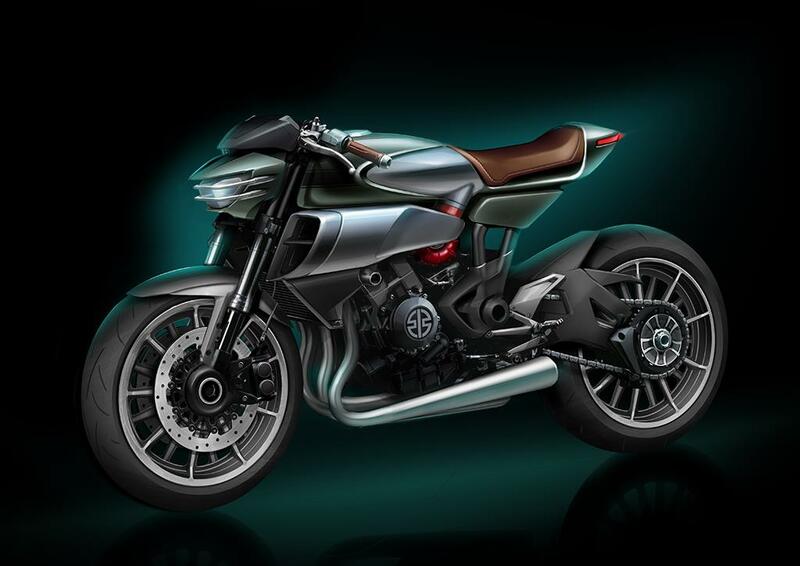 The sketches reveal bikes that appear to blending the very latest chassis, supercharger and electronics technology with a style that one might easily describe as retro. The sumptuous looking brown stitched leather rider’s seat on the Spirit is replaced by a harder, more sporty, one on the Soul (a pillion perch is notable by its absence on both), each using small and modern tail units. While the H2 seems to almost apologetically hide its impressive supercharger ducting, the SC 01 boasts an industrially proud intake along its left flank, which would also mean it would be endearingly asymmetrical, as there’d be no need for an intake on the offside. The new Balanced Supercharged Engine should deliver an interesting change in engine characteristics over the H2R unit, too. 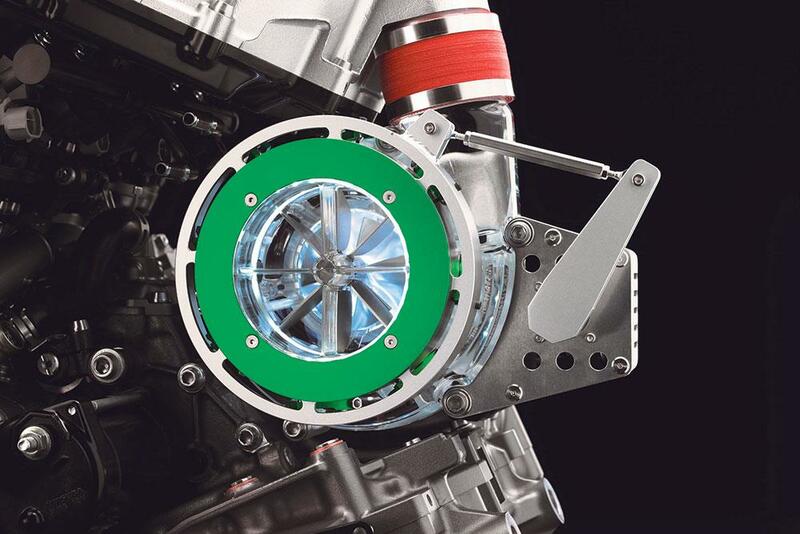 An actuator opens and closes a set of petal-like flaps at the mouth of the supercharger’s impeller, allowing the ECU to govern the volume of air the impeller can ram into the plenum chamber, enabling a greater degree of flexibility in its delivery. Hard throttle openings would see the petals open out to allow a rush of air to its head, and the full effect of the supercharger to pull the horizon towards you, while making the SC a far friendlier ride around town, on tighter back roads and Alpine passes. It’ll also facilitate greatly improved fuel consumption. No firm indication of timeframe has been given for the next Kawasaki air-gulper to land in dealerships, but it’s clear the firm is committed to more, and more wide-ranging, models in the near future. We can also infer from their mutterings around flexibility and fuel economy that the direction will – as we predicted a year ago – spawn a family of new Kawasakis that deliver great performance from smaller capacity, more fuel-efficient, engines. 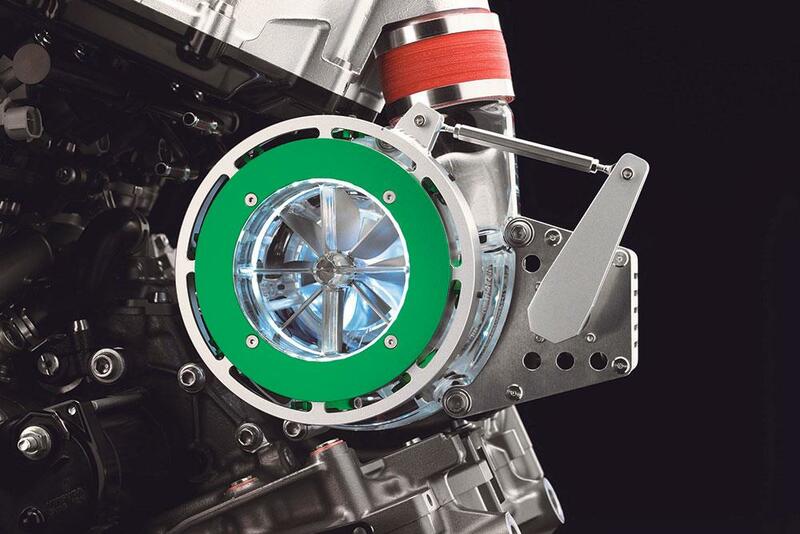 The new engine’s controlled airflow function, which manually limits the amount of air that can be processed by the supercharger, is an easier solution for regulating pressure than adding a variable gearbox to modulate supercharger impeller speed. 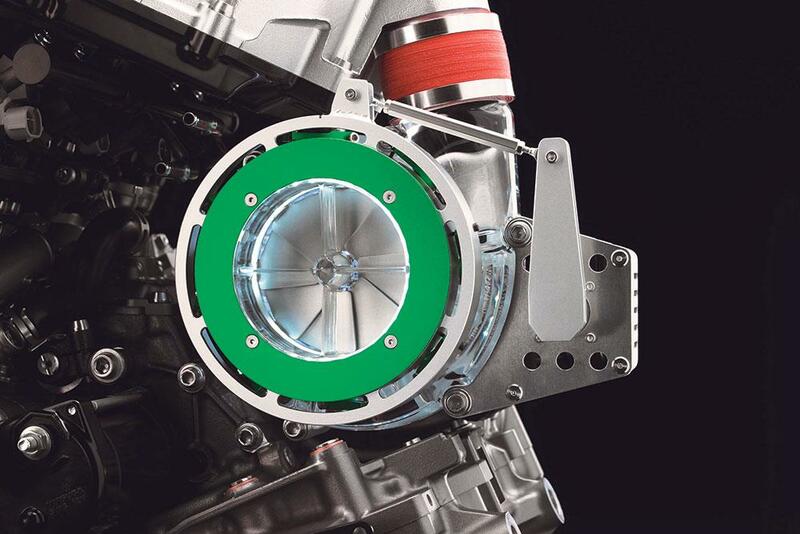 At low throttle openings and low rpm, the bike’s ECU will send a message to the actuator motor which will set the petals to the closed position, restricting the airflow able to reach the impeller, reducing the amount of air that be crammed into the plenum chamber (pressurised airbox). The net effect will be to soften the power delivery and improve fuel economy. As the rider winds the throttle open, the actuator will do the same to the petals, allowing the spinning impeller access to more airflow, increasing the pressure in the plenum chamber, as the ECU also releases more fuel to swirl with the airstream, feeding the cylinders with the optimum level of explosive mist. Because this isn’t an on/off transition, it should give a seamlessly smooth increase in delivery. With the throttle wide open, the petals will be fully retracted, allowing the supercharger to work to its full potential – just as it does on the H2 and H2R. 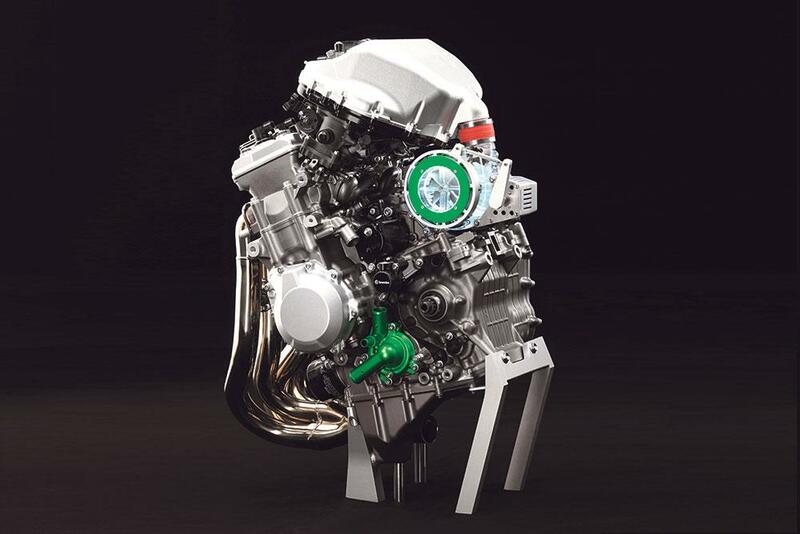 The spec of this motor hasn’t been revealed by Kawasaki, but it looks near identical (outwardly) to the H2, suggesting that this tech could be used on a 998cc unit, capable of delivering anything up to a measured 250bhp. But Kawasaki have strongly hinted that this may make its debut on a smaller unit of around 600cc. Poll: Kawasaki's 296bhp supercharged H2R is causing a storm – but are superchargers the future? Kawasaki's 296bhp supercharged H2R is causing a storm – but are superchargers the future?